Farmer's markets are the unsung heroes of good eating. I have worked them and shopped them for years, and all over the country. What I have found, is that some of the ideas for vendors vary, but the basic farmer's market etiquette says the same. In order to really enjoy the market to it's fullest potential, there are a few things to remember. 1. The farmer's market can't be a hurried event. There are many reasons for this as you will see later, but the main one is that the more time to take to look at what the vendors have to offer, the better chance you have of finding something magical. Once, I was actually shopping at a farmer's market and waiting in a line to buy my produce. As I stood there, I noticed a humongous Blue Hubbard squash sitting right under the vendor's table. When it was my turn, I was able to get that beautiful vegetable for less than $2.00! It was so large, I had to carry it back to the car and then return to keep shopping. Why was something so large, so inexpensive? Because the vendor had placed it down there that morning and no one had seen it. He was thrilled that I finally had found that treasure. 2. Take time to get to know your Farmer. Shopping at a farmer's market isn't like grocery store shopping. You can actually get to know the person who grew what you are going to be eating. That is pretty powerful stuff. Talk to your grower. Ask them what they recommend for that week's choices. Ask how to prepare it and how they like to eat it best. You will not only be getting the freshest food possible, you will also be learning from the person who loves that food. Who better to ask how to make each item taste memorable? 3. Go often. This is not a sales pitch. The seasons often change around us and we don't notice until we turn on the AC or need a winter coat. 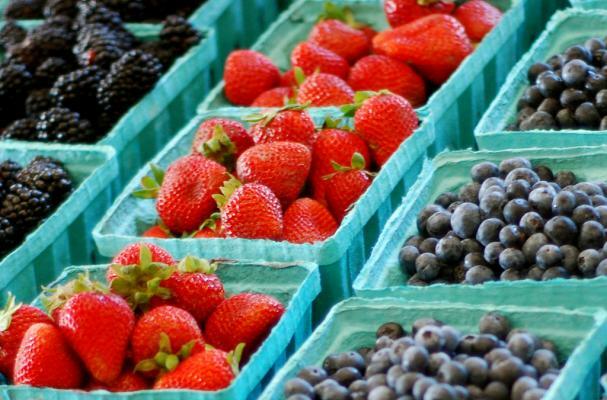 The farmer's market is a perfect place to see how the seasons change and what truly seasonal food is like in your area. The more often that you go, the more variety you will have in your diet. 4. Be open to change. This isn't just a woo-woo comment from a tree hugging hippie. Going to a market really does put you in touch with something deeper. It's creating your own community around food, health, friendship, and common interest. You may find that your preconceived notion is untrue. It happens to all of us and it's always a good thing. Finally, just go to the market with purpose. Don't go with the idea that you will jet in and out with dinner in a bag. I suppose it will be in your bag, but allow yourself to really get to know your farmer AND your market. It will be worth it.